Designer Elizabeth Backup at a recent project in Los Angeles. It only took three years for Elizabeth Backup to become a full-fledged designer — but the road to that fast success wasn't easy. After growing up outside Philadelphia and graduating from Brown University, she set her sights on a move to Los Angeles to land a job in the entertainment industry. And when she started working at WME talent agency, Backup settled in for what she thought would be a lasting and fulfilling career. But by 2014, her passion for the profession had changed. And around the same time, her father was in an accident. "I was wasting away at a desk job that I just didn't care about, feeling a little lost and passionless in a town full of passionate people," she said. "My father was not well, and I was hyper-aware of mortality and the unpredictable nature of life." 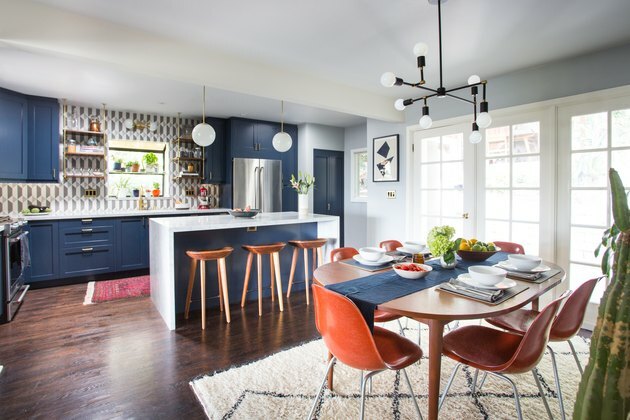 Backup designed this midcentury modern kitchen, which features trendy navy cabinets and a bright backsplash. She knew she wanted to make a change, and like most people, she felt that the most fulfilling work would be something she would hypothetically do for free. Plus, she thought, a traditional desk job wouldn't be the right fit. "I had considered the transition a few years prior, but the thought of starting over at an entry-level position in a new field was daunting," Backup remembered. "I didn't know where to begin, and so I let the idea languish." But, in the wake of her father's death, a career shift felt like the right thing to do. "After a bit of soul searching, combined with some practical exercises, I realized that I wanted to be an interior designer," Backup said. A pair of pendant lights hang above a marble countertop. The lights' gold detailing matches that in the shelving. With a newfound confidence, Backup started small. "I reached out to everyone I knew in the industry, [which was] exactly two people. I combed the alumni network of my college for design professionals, and I talked to anyone who would spare five minutes for me," she said. "One of those conversations led me to an interior designer who eventually needed some help." And with that, her new career began. In 2015, under the guidance of designer Alie Waldman Lapidus, Backup got what she refers to as a "crash course on design." Lapidus showed her the ropes of the field, filling in her resume with the necessary skills to be a designer who understands form, function, and style. 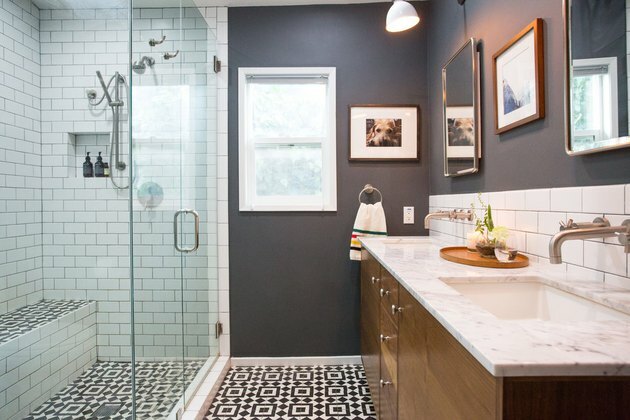 In another project of Backup's, she carried bold tiling from the floor of a bathroom into the shower, and matched it with gray paint on the walls. "I got really lucky," Backup admitted. "Alie demonstrated endless patience for my lack of knowledge." The following year, Backup established her own namesake company, Backup Design. 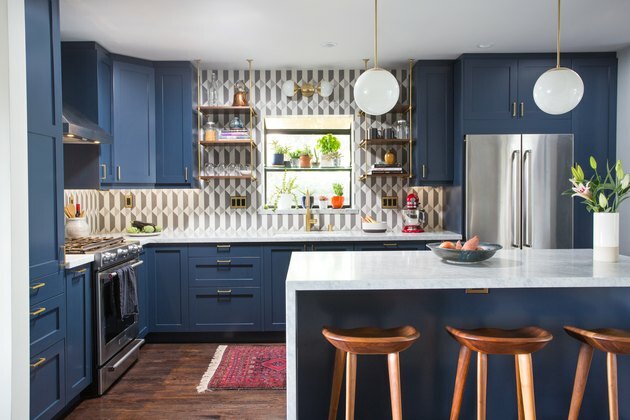 As her own boss, Backup outfits interiors with a modern and confident eye, like the kitchen project she did at her boyfriend's Los Angeles home, which showcases bold tiling and blue cabinetry alongside rust-orange and gold accents. She also began creating and selling custom pillows and dog bed covers made from imported textiles that are hand-sourced in L.A. These are simple, but impactful, items: indigo shades in mud cloth or shibori prints give off the sort of laid-back attitude that's typical of the state. 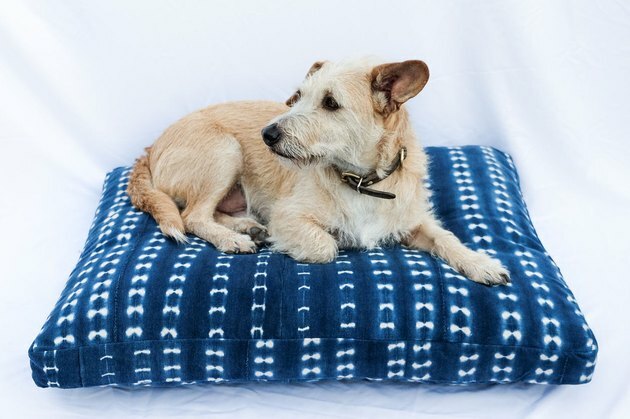 Backup's pet beds are assembled from various fabrics, making for one-of-a-kind products. 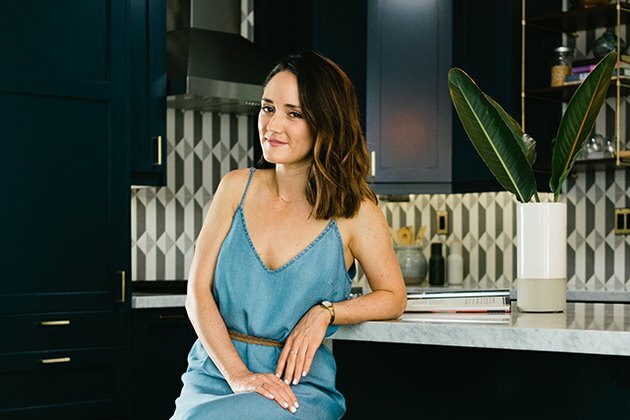 Unlike many of her contemporaries who have a signature "look," Backup allows her clients' personalities and lifestyles to drive the aesthetic, with her input deftly guiding the process. "One of my favorite aspects of being a designer is that it's an invitation to see the world through someone else's eyes," she noted. Her main concern is simple: she wants her clients' homes to be comfortable reflections of their tastes. That may be a lasting lesson from her unlikely start in this career — she knows that everyone needs a haven to reflect and recharge. "Home is a place where you can drop the weight of the world a bit at the door," she said.